Recovery and transportation service available on request. Trailers Kent are able to 'match' any trailer to suit your requirements or we can manufacture a bespoke unit - just for you. Our expertise is being able to understand your needs and offer various alternatives for your consideration at a price within your budget. As a manufacturer we are particularly adept at modifying or renovating most trailers and can therefore provide effective solutions to your trailer needs. We can also professionally service your trailer. If you have any special requirements such as for cadet services and camping then please contact us for advice and pricing. 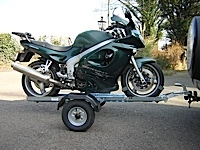 We can supply most makes of trailer for cars or bikes (some are much better than others) within days and we normally stock a few 'bargains' or 'special offers' for immediate purchase. Second user units are a specialty but be quick! Ask about our second hand offers for the latest availability as stock goes very fast. We have a database of future client's requirements and we will pleased to add your details if requested.